Answer: No, but is it a worthy enough system for me to recommend to my subscribers? Read my complete review or for the quick answer scroll to the bottom of the page. I bought the product for $24,00 and signed on for the monthly subscription.$27,00 per month. I cancelled my subscription before the first billing period with no problems. Verdict – Not recommended , Read about my Top Recommendation here . You get access to affiliate market training , 2 websites with hosting , a community of experts that will answer any question you have . Plus a whole lot more . You also need a Warrior Plus account and a ClickBank account but there is no Video for this. Warrior Plus and Clickbank are both required to request to promote affiliate products. Covert Commissions will then email to your hands free list, more on this later. When you sign up to covert commissions for free you get access to 1 Mission credit. As a monthly Pro member you get 10 credits, allowing you access to 10 products. You then get 1 credit per month as part of your membership fee. These missions are affiliate products that are listed either on JVZOO, Clickbank or Warrior Plus. Hopefully the subscriber will buy the product and you earn the commission. The system is Done For You, allowing you to start as soon as you sign up. Of course if you don’t receive to access link and password like I did you will have to wait. There is no cost involved by having to have an autoresponder such as Aweber or Get Response . This does keep the monthly cost down, as far as your email list goes. There is no real need to have a website or web hosting. This also contributes to keeping your overall expenses lower. Most of the products already have squeeze pages and some have pre-made promotional material. 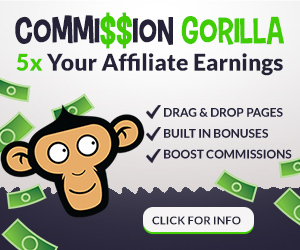 This is a time saver and makes it possible for people new to affiliate marketing get started easily. You are not guaranteed to be approved to promote the missions. These are the affiliate offers within the Mission control. This means that you have used 1 credit for something you can’t even promote and earn income. In my experience this pertains to the new products. The creators of the product are reluctant to allow newer affiliates ( probably like you ) to promote the product . This is because they do not want to show a “high click through rate” making” the conversion rate” lower. This could result in more experienced marketers reluctant to promote the offer, resulting in less sales. Once you have managed to get some traffic to the offer you are promoting and someone signs up, you have absolutely no control over what emails are being sent to your subscribers. This could result in them being sent products with affiliate links that you will not get paid for ( if you are not an approved affiliate). The training, while it looks extensive consisting of 12 videos is fairly empty. By this I mean if you are not a complete newbie, there is not much there, no Golden Nuggets or valuable take away’s. Costs to maintain and promote can add up quickly . Who is Covert Commissions For ? I would have to say if you are a complete Newbie and have no prior affiliate marketing experience some information is good. There is a free sign up offer here , sign up if you like take a look around. Use free training and then choose if you want to continue on with the system, just to clarify I am not recommending this product. Please note my rating below. You can access the product through the JV Zoo platform, which I did. I received my welcome email and access to the member’s area which I could not access. I then contacted support desk “Wildfire Concepts ” and submitted a ticket. The support team did respond quickly given the time difference, they are located in Australia. As well, I emailed Cindy Donovan regarding plight. My access issue was straightened out and finally I had access to my member’s area. I was satisfied with the support I received. Is Covert commissions a scam , NO, while the system and member area are fairly fluent. I feel there are some short comings and there are better opportunities available for the same investment. VERDICT: Is Covert Commissions a Scam, NO but it’s Not Recommended , What I do recommend is you read on . Think about this for a minute , you probably found my review on Covert Commissions through a search right ? So what if I told you that you could learn how to have free traffic visiting your website too . That you could start for free and learn to actually build an online business no matter what your niche is . Have access to a community of successful like minded novices an experts, to answer all your questions . Don’t believe me ? Check it out for yourself , it’s called Wealthy Affiliate . The largest community of helpful people to ensure your success! Unbiased review, that’s what I will call it. There lots of scam done for you affiliate platforms out there, I have been victim to a few of them.Readers don’t know how valuable reviewers are until the lose money and time. They promise heaven and earth until you make first payment. Aside from JVZOO software, I do not see a unique selling point in their products.Thanks for keeping it real on the internet. Hia and thank you for this informative article. I really enjoyed reading it. Heard about this offer before from a friend that used tried it. He said it was not the best program but it did the job for him. I also agree with you. There are better options available online. Especially when you consider programs like Wealthy Affiliate. Hi, thanks for sharing this review. I signed up for the free membership and I can see that there are some benefits to Covert Commissions. A newbie can gain some information and there aren’t too many costs involved, which is good, but it’s still laking a lot of content. Also, it might not be the best training for someone who’s more advanced in Affiliate Marketing. What would you recommend as a better alternative to this?